(MP091). Frank Watson Wood (1862-1953). Watercolour signed and dated 1938. Discovered in a picture gallery in Arizona, USA in September 2005, this is a magnificent great watercolour - it measures 29 x 19 ins (74 x 48 cms) showing the 2nd Battle Squadron, Home Fleet ploughing their way through a lively sea on a bright day. Leading the squadron is HMS ROYAL OAK (Captain T B Drew OBE RN) wearing the flag of Rear Admiral 2nd Battle Squadron, Rear Admiral L D I MacKinnon CB CVO. 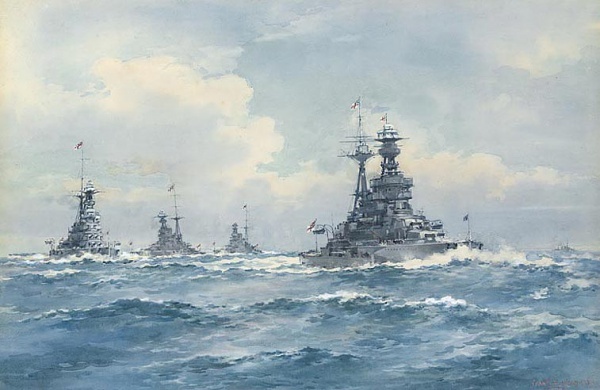 In line astern are REVENGE (Captain W F Wake-Walker OBE RN), ROYAL SOVEREIGN (Captain J W S Dorling RN) and RESOLUTION (Captain C H Knox-Little RN). The fifth ship of the 2nd BS, RAMILLIES, was in refit. Ships are dressed with masthead ensigns and Wood’s brush suggests that a man ship party is mustered in the for’ard waist of ROYAL OAK  ceremonial signs that are indications a steam past is perhaps in progress?